Every Saturday morning a group of locals meet in a public park in the town where I live. They gather to share produce they have excess of and go home with things they need. The event builds community and reduces waste. Some people attend just about every Saturday and others come along once every few weeks. No money exchanges hands. What sorts of things get shared? 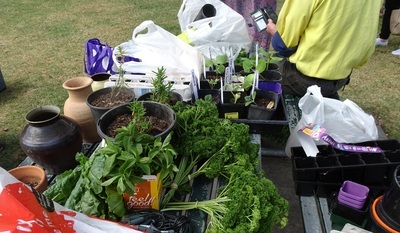 Home grown herbs, fruit, vegetables, seeds, seedlings and cuttings make up the majority of items put out to share. Each week is different and sometimes there are free range egg from backyard poultry, gardening magazines, bulbs, plastic pots, empty jars and bottles available. This morning someone had brought along some pottery and surplus knitting wool. There were also four jars of chutney. Sometimes a person will ask if anyone would be interested in a particular item they have at home. If someone shows interest they will bring it along the next time they attend. Sometimes requests are made via the Facebook page. 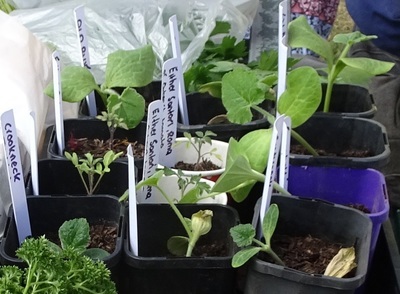 Information about how to grow a cutting or seeds of a particular plant is freely supplied. It is useful to get information relevant to the local area. Sometimes people donate gardening magazines or books. Once the next person has no further use for them they may bring them back and someone else can make use of them. Are there lots of rules? There are a few guidelines rather than rules. As it is a share people bring what they can and take what they need. One week a person may bring along a lot of produce but not have anything the next time. This is not a problem. If anything is left over, the person who brought it takes it home. This ensures the park is left tidy. There are no fees for being involved. What are the advantages of participating? Events such as this show that community spirit still exists.